The ensemble’s pianist Stefan Cassomenos talks developing Australian culture and the challenges facing young composers. What excites you about performing new and recently composed music? Contemporary music is uniquely reflective of the times we live in, and performing this music feels very much to me like one is living in the moment, and meaningfully engaging in a global artistic conversation. I also enjoy performing music from previous centuries, and with regard to older music, I also feel an incredible excitement when breathing life into a manuscript from hundreds of years ago, constantly rediscovering style and seeing ideas afresh. But with new and recently composed music, the discoveries are in fact ours to reveal, and the style is what we make it. The main challenge, as with all music, is to understand as best one can each composer’s musical language, and thereby unlock their means of expression. With a brand new piece of music, the full expressive potential of the piece is often not totally realised in the practice room, and instead reveals itself during the first performance. This is quite a bit different to performing works which are heard regularly. With new music, there is a real temptation to decide that you’ve understood all there is to understand about a piece, and my challenge is to withhold that decision, and always keep searching for more expressive potential. You commission and perform a lot of works by Australian composers. Why do you think this is important? It’s only important if one thinks that it’s important for living Australian composers to exist, and for Australian music to continue to be composed, and for Australian culture to continue to develop. I know lots of Australian composers, and I consider that one of my most important roles as a performer is to play music written by people who I know personally, to engage with my community. I think Australian music, and indeed all Australian art, is important to Australia as a nation, because I believe we are a unique nation with our own particular things to say. Nobody else will say our things for us, and we need to preserve Australian music as one of many platforms through which these things can be said, and the culture can thereby continue to develop, rather than recede. How did you choose the works on the Sydney programme? Can you tell us a bit about them? There were a few factors in our choice of programme for Sydney. 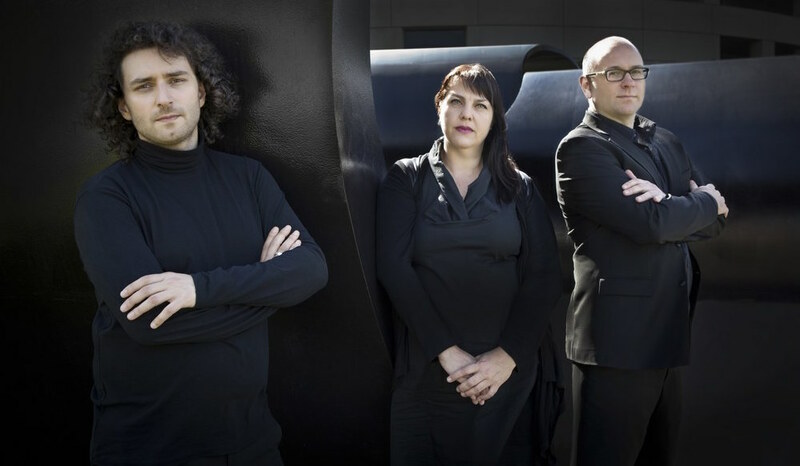 We were keen to include music by Sydney-based composers, and so we are playing works by Sally Whitwell, Andrew Ford, and Harry Sdraulig, all of which were commissioned and premiered by PLEXUS. In every programme we try to play one of the eight early pieces written for our particular trio combination before the Verdehr Trio started their commissioning work in the 1970s – and so we have included a movement from the trio version of Stravinsky’s The Soldier’s Tale, which was written in 1920. We also like to always include one of the 220 pieces commissioned by the Verdehr Trio, because we are keen to keep their work alive and resonating around the world, so on this occasion we’ve chosen to play DASH by Pulitzer Prize winning composer Jennifer Higdon. We’ve also included some of our favourite works, just because we love them. These include works by Allan Zavod, Robert Davidson, Richard Grantham, and Julian Yu, all of which were commissioned and premiered by PLEXUS. It’s a bit difficult to choose works on this basis, because we really love lots of the music which has been written for us! What are the biggest challenges that face young and emerging composers? The biggest challenge for any composer is to get their work played and heard. This is exacerbated for young and emerging composers, because nobody yet really knows who they are, and so they have an additional big challenge – to get their names out there. Only after people know who they are will their music be played and heard, and perhaps even specifically commissioned. It takes years to establish a reputation and a develop a career as a composer, and so another big challenge is to be patient enough to persevere. How important is it to mentor and support the next generation of composers? Many of the next generation of composers are deeply in need of supporters and mentors. On the other hand, some are remarkably self-sufficient, and will guarantee their own success. At the very least, I believe it’s important for there to be as many artists and ensembles as possible providing useful opportunities, and making available the resources which emerging composers may need. What advice do you have for young composers who want to build a career? The best advice I could offer to a young composer is to maintain strong relationships with performers, supporters, audience members, potential patrons, and with other composers. I believe that building a career is about building a network, and through that network one can gain the experience necessary to really hone one’s craft. PLEXUS makes their Sydney debut at the Yellow House, Sydney July 24.